Parasols are a type of umbrella made for protecting you from the sun. Unlike rain umbrellas, parasols are traditionally made from paper and bamboo or fabric. 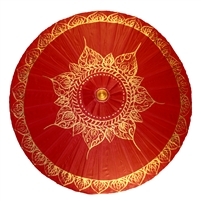 Usually used for sun protection, parasols are often seen as wall and ceiling decorations. 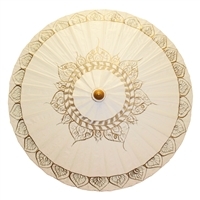 World Buyers stocks a wide range of parasols that feature exclusive designs and styles. You can find everything from hand-painted henna designs to nouveau to day of the dead and much more. 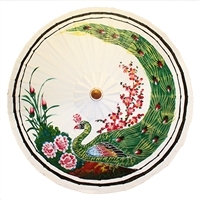 Shop wholesale hand-painted parasols with World Buyers today! Awesome hand painted Day of the Dead Sugar Skull designs with bright traditional colors! 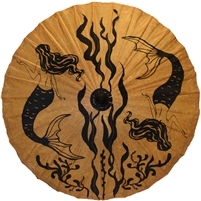 Exclusive WB mermaid design on this handmade parasol from Thailand. 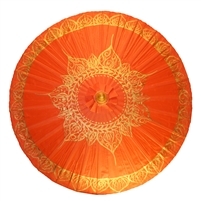 Bright and sunny yellow parasol with gold Tibetan design. Painted on Canvas. Product Dimensions: 33"dia Must order in increments of 2,4,6, etc. It's the beautiful color of the California poppy... our state flower! Gold Tibetan design. Canvas-like fabric parasol. Unicorns, stars and magic! Parasol is 33" diameter. Made of bamboo and thick oiled paper. Order in increments of 3, 6, 9 etc. Tropical fun in the sun! Large and small pineapple Parasol is 33" diameter. Made of bamboo and thick oiled paper. Order in increments of 3,6, 9 etc. 12 Sun signs in silhouette Parasol is 33" diameter. Made of bamboo and thick oiled paper. Peacock Strutting Hand Painted Parasol in constructed of bamboo and canvas. Beautiful lime green parasol with gold Tibetan design. Canvas-like fabric. WUMC001 Must order in increments of 3,6, 9, etc. Must order in increments of 2,4, etc. Must order in increments of 2,4,6, etc. Colorfully designed and embroidered fabrics and sewn in triangles to complete these parasol patterns. Each is unique and these images shown are a sampling of fabric styles only. 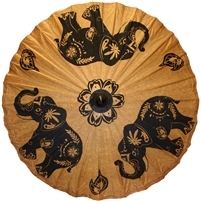 Hearts and Scrolls designs make this parasol a unique and popular choice. Paper parasol, Hand Painted, black paint only. Asian calligraphy style Dragon breathing fire! Unique "alternative" design by World Buyers! Pirate or seasonal themes make these styles hugely popular! Parasols can be hung in the ceiling corner of a room to add to themed decor! Leave the rest to your imagination! Unique original World Buyers design! This is an original World Buyers Design. 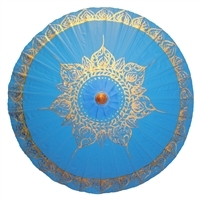 These lovely parasols are available 6 solid colors with flower and butterfly designs on each. Elegant peacock on natural paper makes a lovely parasol! Hand painted in Thailand with rich gold accents. Order increments is 2,4 etc.